As a fan of the new adult category, I was eagerly looking forward to reading something that didn’t fall into the contemporary romance genre, and The Wicked We Have Done definitely is not a contemporary romance. Set sometime in the future (near or distant, we never really know), Evalyn Ibarra’s been convicted of murder and sent to the Compass Room, a sort of obstacle course designed to gauge a prisoner’s actual innocence, regardless of the jury’s verdict. If she survives a month in the Room, she’ll be cleared. But as the days pass, she starts to wonder if there’s a glitch in the program, killing prisoners who deserved to live. This is one of those stories that will be held up in comparison to The Hunger Games. Yes, there are similarities: the obstacle course itself, the deaths of the participants, even the violence. But if you go in expecting an older version of The Hunger Games, you’ll probably be disappointed. The Wicked We Have Done deserves to be looked at as an original story in its own right. Plus, the violence is closer to the Battle Royale end of the spectrum. Seriously, some of the stuff that happens in here would make the events of The Hunger Games seem tame. The pacing is fantastic. 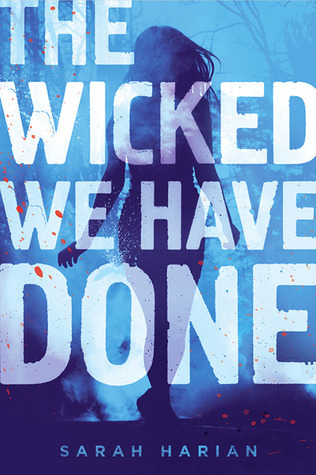 The Wicked We Have Done is a quick, snappy read, yet still allows you to get to know the characters well enough you come to care about them and what the future holds. Most of the characters are interesting and complex, and I liked Evelyn, how her actions were at odds with what everyone thought of her. She’s not out to change people’s perceptions of her and doubts she’ll leave the Compass Room alive. She’s willing to step up and battle the other prisoner’s demons with them, lending them strength when they have none. The romance between her and Casey, however, came off as a little abrupt. Before things heated up between them, I didn’t see much chemistry or attraction. That may have partly because I didn’t feel that Casey was as well developed as he could have been. He was a bit dull, his emotions flat compared to Evelyn’s. What I really loved, though, was the reasoning behind the Compass Room and the effect it had on the prisoners. So often we think of guilt in black and white—either you did it or you didn’t. And while Evelyn never disputes she’s guilty of the crime she was convicted of, the reader learns through flashbacks that what she was convicted of and what she believes she’s truly guilty of may very well be two different things. Book two A Vault of Sins is tentatively scheduled to release this fall, and I’m looking forward to seeing what’s in store for Evelyn.